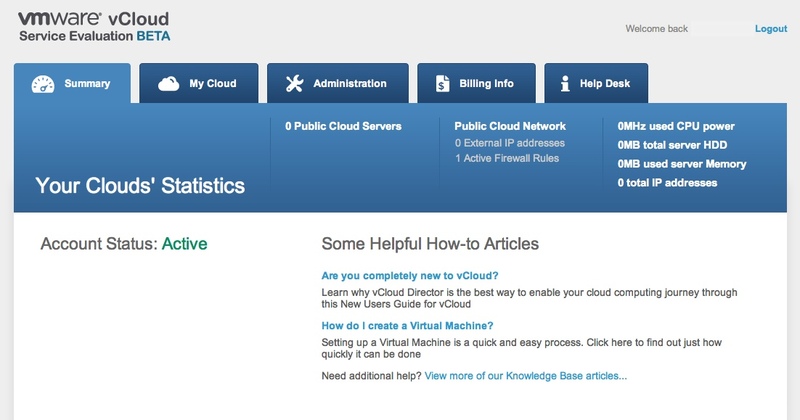 Many have asked for such a thing, few have been able to really get a vCloud Service Evaluation setup quickly enough. Well VMware has done it for you! I have been talking about an internal vCloud Beta I was playing with a few weeks ago well this is it!! Get yourself signed up for this vCloud Service Evaluation Beta so you can help us test drive the service. The idea here is that this is already a full functional vCloud Service stood up for you to try out as a consumer. There is no vCloud setup to deal with, you will have access to the vCloud Out of box portal, as well as the API’s. There is a vCloud Catalog of items to deploy so you can get a real feel for what vCloud Director has to offer to your potential consumers. This is really meant to “Test Drive” vCloud Director without having to stand up the infrastructure yourself. Currently we are taking the BETA registrations so please if you love to do BETA and provide feedback…..GET SIGNED UP! Click the image above or CLICK HERE to register. The BETA registration is for a limited time so get in now and tell us what you think!